Design and development of electronic equipment complements our development trio (Web - Software - Electronics), allowing us to offer our customers unlimited possibilities in what can be done using the technology. In many cases, for some specific applications, it is not possible to find a solution on the ready-made market that meets the requirements of a project, this is when the development of a custom hardware is needed. Working with multiple companies on a development project requires a very well-designed project management to create a coherent product. This is often not properly managed by the beneficiary and the risks of developing an incoherent product and making a bad investment increases signifficantly. Working on all aspects of a project with a single company, like EDGE, allows us to keep the "in-house" development cycle, so the solution will be one that integrates perfectly into all areas of the application, and the end product is a successful one. At EDGE we offer complete solutions from design, to PCB wiring design, to firmware development, even to 3D prototyping of the final product. We strive to offer complete services to our customers in terms of developing a finished product and putting it into mass production. That's why we're trying to cover all the steps involved in developing an electronic product, even the software that runs in the back. Designing a correct architecture is very important to allow the product to be easily developed in the future or expanded. What distinguishes us from others is our expertise both in web, software, and electronics, which allows us to design solutions that integrate perfectly in all of these areas and work in full harmony. Creating a prototype involves several iterative steps that build the final PCB wiring that will enter mass production. At each step, the product is intensively tested to find any bugs that are repaired in the next iteration. Thus, we can ensure that the final version is a stable one and meet all the requirements of the project. But the development of an electronic product does not stop there. It will need a user-friendly physical shape that involves designing a enclosure to match the standards required by the product. We use the latest 3D prototyping methods with special 3D printers as well as advanced CAD solutions to help you finish the product to the very last detail. The development of a product is a complete cycle that needs to be managed step-by-step to the smallest detail to ensure that the final electronic equipment is perfectly integrated for use. Our experience at EDGE has pushed us to develop our knowledge in all of these areas in order to create complex products, combining software and hardware solutions. 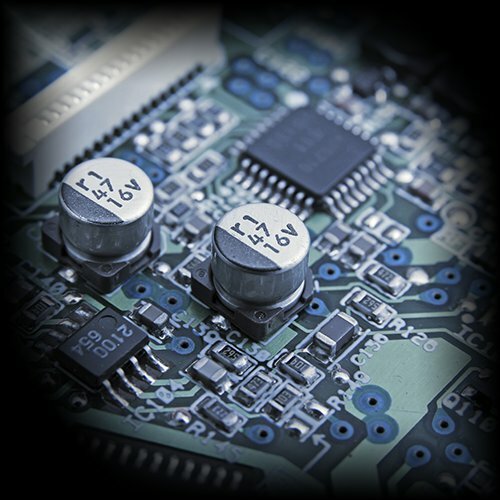 We strive to always use the latest proven technologies in electronics development. Each electronics project has a special element, so choosing the right technogy is absolutely essential to create a professional solution that can be maintained and expanded easily on the long run. Do you want to build an electronic product together?